1.1 The 500T/24H refined wheat flour milling machine below is specially designed according to the wheat which belongs to hard wheat type. Sieve of purifier surface: 0.046m2/100Kg.wheat.24h. 1.3 Considering the requirement of environment pretending, we suggest the drying cleaning system which is popular in Europe. At the same time, intensive dampener，which one controlled by PLC for dampening is used to get the average moisture for milling. The technology is 2 sieves, 2 scourers, 2 destoners, 2 dampeners, 3 magnetic separators. The clean wheat has the cleaning flow of air channel to ensure the purity of the wheat. All of the machines above are of blocking type. 1.4 In the tropic with wet climate. The clean wheat needs less than 18hours’tempering before going to the mills. In the tropic with dry climate. The clean wheat needs more than 18hours’tempering before going to the mills. 1.5 Economic technology guideline: If producing 1 grade of flour, the extraction rate is 75%, cumulative ash content is 0.54-0.62%. If producing both 2 grades of flour, the extraction rate of grade 1 flour is 50%, and ash 0.43-0.54%; and the extraction rate of grade 2 flour is 28%, and ash 0.62-0.65%. The ash content above is on wet basis. The power cost is no more than 66kw.h/t flour if conventional operation. This data is based on the wheat better than grade 2 from America or Australia. 1.6 Flour is blown to the packing store which is 120 meters far away. And there is a store for small bag packing which is 20 meters from flour workshop, an electric valve is to distribute the flour to the small bag packing store or 120 meters big bag packing store. Flour is blown to flour store to pack for keeping workshop clean. 1.8 Total power: 1650 KW. 4.1 The first week after installation is commissioning period, the capacity is 480T/24H. The second week, the capacity testing is up to 520T/24h. The normal capacity is 500T/24h. 5.Technical flow chart (refer to drawings). Installing technicians who can speak frequently English should be prepared by the customer. 1. Dimension of the workshop: read drawing. 2. Material warehouse and product storage: design and install by the buyer. 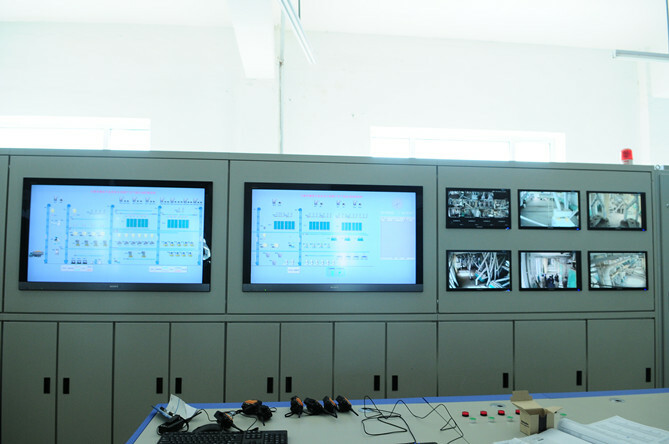 4.Worker: every shift(8 hours)----1 worker in PLC controlling room, 1 worker in flour section, 1 worker in cleaning section,2 workers for packing. Other workers for transfer of crude wheat and product is not including in this.